This entry was posted in Resources on February 27, 2007 by Dotan Dimet. 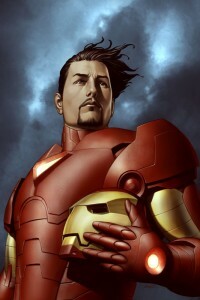 Iron Man: Extremis by Warren Ellis and Adi Granov (Bosnian, not Israeli) is very successful at what it sets out to do, which isn’t so much to update the concept of Iron Man for the 21st century as it is to pitch the character to Hollywood. 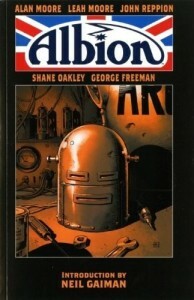 In other words, it’s an uncomplicated story with plenty of exciting, realistic action sequences done in cool photorealistic-style art and set in its own little movie-like world: the Avengers are mentioned, but the character’s background and abilities are rewritten in many little ways to make it more modern and realistic and less “comic-bookish”. The story follows a three-act structure (intro, fight, crisis+origin flashback, 2nd fight) which the movie types can digest (although it’s a six-issue “decompressed” mini-series, and so feels shorter than a feature film), and Tony Stark has the profile of Tom Cruise. This was probably Avi Arad’s favorite comic of the year. 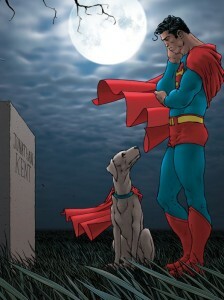 Grant Morrison and Frank Quietly’s All-Star Superman does Smallville (the Kents, Krypto the super-dog) this issue. Superman is a character that one the one had has a very simple and iconic story, and on the other hand also has a rich and goofy history full of what Alan Moore fondly called Mad and Beautiful ideas , particularly under the editorship of Mort Weisinger. Alan Moore’s collaboration with Curt Swan, just before the John Byrne “reboot” of the character, paid loving homage to those weirder elements, but most writers who’ve handled Superman in recent years have tended to focus on the iconic elements and themes of the character, to simplify his story to its recognizable core (Lois, Luthor, Daily Planet, Last Son of Krypton – pretty much the movie/animated series take). Morrison’s approach is different: he puts in the weird, zany, kitchen-sink sense-of-wonder stuff, but he tries to be as inventive as the Weisinger-era writers, coming up with his own stuff. And while I appreciate what he’s trying to do, and I think his iconic takes (Superman himself, for example) are great, the Morrison weirdness doesn’t seem to fit. I actually blogged about Albion (art by Shane Oakley, plot by Alan Moore, script by Leah Moore and John Reppion) when it was still upcoming, nearly two years ago. Now that I’ve read the collection, I’m glad I waited for this instead of attempting to buy single issues when it was serialized. This story has got too many characters and bits and probably not enough plot. The concept of the series is the familiar idea of all the old super-heroes being imprisoned and forgotten, except that here they’ve also locked up all the villains and weirdos and living cartoon characters – everything that’s ever been in a British comic strip, apparently. And we’ve got a rag-tag bunch of heroes who uncover the truth and eventually get around to breaking everyone out, on the one hand, and on the other we’ve got lots of meandering in the prison, introducing loads of forgotten and obscure characters. There are a lot of bits I liked, but nothing quite builds up or gets enough screen time to have a real impact. Hurricane and the Spider (both have also appeared in Jack Staff) have terrific interview scenes, but don’t live up to them later. The Spider in particular comes across as the coolest comics character on earth – and then he sort-of vanishes into the night, without any suitable climax. No, wait a minute – on a second reading, I picked up on the bit where Fred Ackley says that the Spider’s gone and that he’s taken Mytek – and indeed, turning back the page and seeing the bit where Mytek (a giant robot gorilla, if you have to know) busts out (and stomps Hercules Hurricane), it’s actually the Spider that is operating it. So there is an actual showdown there between Hurricane, the epitome of brawn and bluster, and the Spider, the master thinker, but it’s subtle, and the Spider disdainfully tramples Hurricane while casually making his getaway. Clever, but more tantalizing then satisfying – I’d have liked a whole book’s worth of the Spider. The Spider, portrayed as a criminal mastermind who enjoys outsmarting other criminals, reminded me of Sleeper vol 3 and 4 (Ed Brubaker, Sean Phillips), which I also read this weekend. Sleeper is the story of an undercover agent infiltrating a criminal mastermind’s super-villain gang. This is grim but enjoyable stuff, a crime/spy thriller with superpowers. There’s the violent but sometimes funny life of the super-powered grunts, who while away the time between the bursts of furious action by telling each other their “origin story”; and there’s the nerve-wracking struggle of the protagonist, Holden Carver, to evade the machinations of his two bosses (the “good”-but-ruthless spymaster John Lynch and the insane manipulative terrorist Tao). 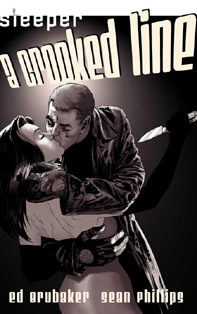 These two books collect “season two” of the series, the nail-biting conclusion, and at their emotional core is the protagonist’s doomed relationship with Miss Misery, a complex villainess with (literally) a physical dependency on being bad – which means a lot of depravity, and plenty of angst. This entry was posted in Comics, long on February 25, 2007 by Dotan Dimet. The Golden Compass movie web site has some concept art and a pretty flash alethiometer; got there via a steampunk blog called Brass Goggles, where you can find some alethiometer combinations that unlock hidden images on the movie site). I see that Daniel Craig (Lord Asriel) isn’t the only actor from the last James Bond movie on the cast; Eva Green, the exotic beauty de jour is Serafina Pekkala. I don’t have much of an opinion about the rest (Ian Cocksuckers McShane as an evil CGI polar bear? Yeah, whatever). The one case of obvious casting is Lee Scoresby; I bet Sam Elliot’s deamon would also be a Hester. This entry was posted in Science Fiction and Fantasy on February 16, 2007 by Dotan Dimet. I did a stealth upgrade of the roleplay.org.il forums early Saturday morning, from a creaky old patched and hacked phorum 3 install, that had been modified by various hands, including Bo, Fogi and Hershko, and which still used visual Hebrew, to a nearly-new Phorum 5 version, with bells, whistles, RSS feeds and search that works. So now I’m messing about, adding functionality, fixing mistranslations, dickering with colors and CSS and what-not, and giddy with the power of controlling every detail of this forum people are actually using. Although the glory days (several ages therof) of our forums are long gone, perhaps this will breath some life into them. The Society for the promotion of Roleplaying in Israel (that’s our official name!) has had a site for ages, and so far it has never quite lived up to it’s potential – it has giving us some remarkable applications, such as a community-wide phone book and (sigh) a once-lively-if-haughty forum (you call it elitism, we call it standards), but failed to become a major roleplaying destination. It’s probably too late now, but one can hope for better times. This entry was posted in Blather, Roleplaying on February 12, 2007 by Dotan Dimet. I’ve been using Linux (Kubuntu!) on my home computer since around late June 2006. No, it’s not any better than Windows XP. In fact, it has it’s share of annoyances. But I sit in front of my computer on an uncomfortable chair in a cold and dusty enclosed balcony with no elbow rests, so I’m used to being uncomfortable using my computer. But it’s telling how much discomfort I found when booting back into Windows to do some work with 8-bit Hebrew files (you can’t even see 8-bit Hebrew in Scite on Linux), and having to make do with Firefox 1.5.0x and Firebug 0.4 after getting so used to Firefox 2.0 and Firebug 1.0. Which I also use at Work (Windows again). Yep. Because “Desktop” is now “the environment you use to run your browser Firefox”. Sort of like how “Windows” was once “the environment you use to run Word”. This entry was posted in Blather, Software and Programming on February 12, 2007 by Dotan Dimet.